After finally breaking out of the 8/9 spot where he'd always face Michael van Gerwen, he's now slipped back there, somewhat due to Gurney coming through and Taylor hitting some big cash, but it's where Dave is and he's got a real awkward draw before he'd even get to the defending champion. 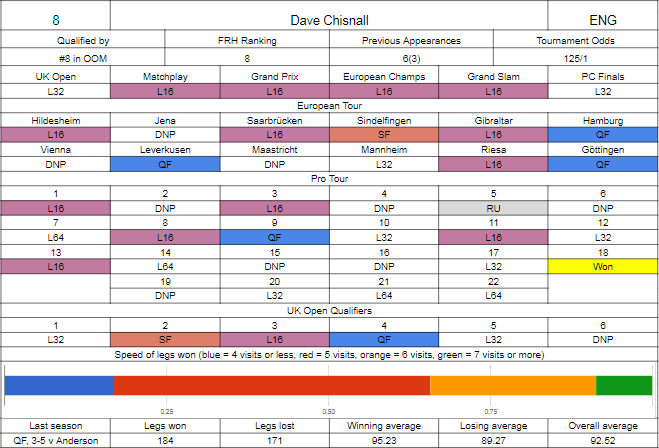 If we ignore that Chisnall has failed to get to a major quarter final since last season's World Championship loss to Gary Anderson, Chisnall's done OK - he's not had any first round losses, in Europe he's not had any real hiccups, apart from in Mannheim where he lost to Nathan Aspinall, he's kept things ticking over solidly on the floor, he's got another ranking title, albeit one where the toughest opponent he faced was Jelle Klaasen, and he's maintained his top 8 status in the world and shown that he can threaten the rest - see in particular the second half of the Premier League, where he would go undefeated after Judgement Night and nearly sneak a top 4 place. But let's look at the major defeats - Peter Wright in the UK Open, fine. Alan Norris in overtime at Blackpool? Probably should win that one. Thornton at the Grand Prix should have been cleaned up. Rob Cross in Hasselt, fine, Glen Durrant at the Grand Slam, yeah, understandable, Willie O'Connor at Minehead, really? None of those seem unwinnable, and they're the sorts of games that Chisnall needs to win in order to push out of the 7-10 bracket, and he's not going to get that elusive major like that - you lose enough when you run into Michael van Gerwen all the time, you can't throw away title equity by dropping chances before you even get to that stage. 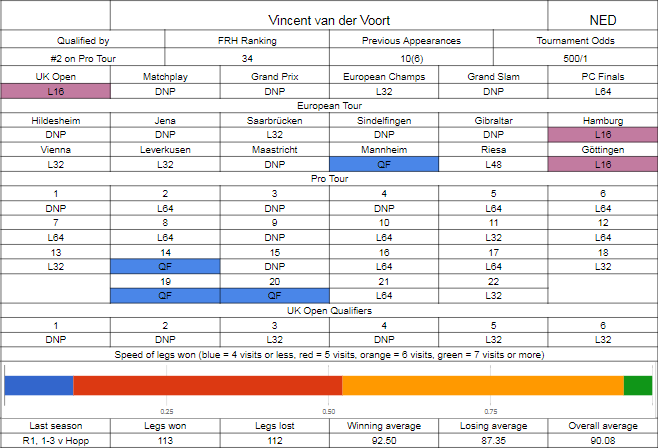 Vincent seems to be somewhat free of the back issues that have plagues his career over the past few seasons, and he's playing notably better. Denied a seeding due to Jonny Clayton's last gasp run at Minehead, he comes in second on the Pro Tour rankings and gets a fairly awkward draw as a result. His best major result came early - he did reach the last sixteen of the UK Open, needing to come through a decider against James Wilson to make the money, and from there he had a routine win over Ronny Huybrechts before a tense deciding leg win against Jelle Klaasen. Daryl Gurney would be too much however. From then in the run up to the Matchplay he couldn't hit much form, a string of thirteen Pro Tour events where he only reached the board final twice would see him too far behind to reach either the Matchplay or the Grand Prix. He was able to qualify fairly consistently for European events, and has taken out a few seeds - albeit Benito van de Pas, Mervyn King and Ian White are towards the back of the list of seeds you want on your scalp list. The back end of his Pro Tour season was better, with three quarter finals (including beating van Gerwen in one, snapping a twelve game losing streak against him), but in the TV stakes he had a hat trick of disappointments, losing to Benito van de Pas in the opening game in Hasselt where he had two match darts, losing by the same score to Robbie Green in the opening game at Minehead where he couldn't generate more than 1 match dart given six darts to finish 117, and lost to the same player in the final qualifying round for the Grand Slam. This is going to come down to a few things - first, consistency. If Dave can hit doubles with any sort of consistency, he wins. If Dave can have fairly few legs of the type where he starts 60-100-59 or something like that, he wins. If not, and if Vincent can be in a state where he's healthy and able to keep up with the scoring as he can, he stands a chance. It'll need a few things to click together correctly, but it's perfectly possible. Your 1996 World Champion (1996! There's players here that weren't even born then!) needs no introduction, but let's look at his season. And it's really quite good. The UK Open qualifiers were great to him, with three quarter finals and a last sixteen run, beating van Gerwen in one and needing Wright (twice) and Chisnall (in a decider) to stop him in those quarters. The main event would see him surprisingly lose to Dave Pallett, but continued good form on the floor would see him safely qualify for the Matchplay - the peak of which was a Pro Tour win in June, beating Chisnall, Gurney and Anderson with some sensational throwing. The Matchplay himself would see him run into Adrian Lewis with both playing well in a good game, and before the next major he'd have a European final run - facing van Gerwen in the Netherlands is never going to end well, but he came through both Wright and Suljovic in earlier rounds, banking ten grand that should see him pretty safe for at least next season's Matchplay. He got a tough draw in Dublin in Rob Cross, but Cross wasn't playing well for about the only time this year and Beaton got the win before getting handily beaten by Barney in round two. Drawing Daryl Gurney in Hasselt was also unfortunate, but it did come together in Minehead recently, beating Ronny Huybrechts, Jelle Klaasen and a decider against Jermaine Wattimena to reach the quarter finals, before blowing a 7-4 lead in a race to 10 against Jonny Clayton. 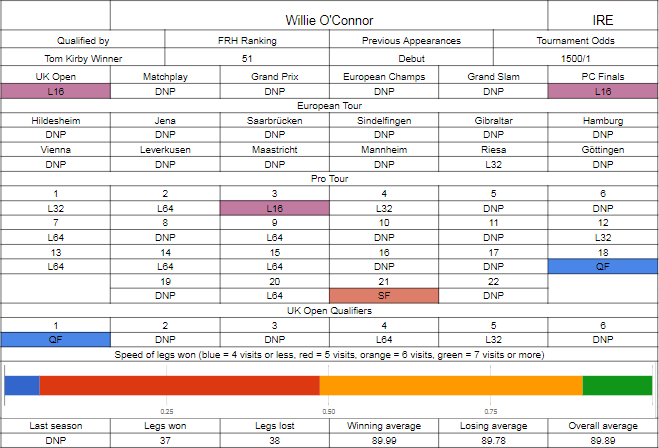 Willie O'Connor is a name that's been around on the pro circuit for quite some time now, and while he's been on our screens since 2010 in the UK Open and Grand Prix, he's making his world championship debut at the age of 31, so still has plenty of time on his side to really establish himself. He's qualified here through winning the Tom Kirby memorial event, basically Ireland's national championship, beating Jason Cullen in the final to go one better than he did in 2009. This event has brought us Daryl Gurney, Mick McGowan and Connie Finnan in the past, amongst others. O'Connor's been a tour card holder since 2011 and was straight out of the blocks with a quarter final in the first UK Open qualifier, beating Ritchie Edhouse straight after Edhouse had beaten van Gerwen. That result and a couple of other cashes would see him make the round before the money, where he beat Steve Lennon in a local derby, then get decent draws against Mick Todd and Ronnie Baxter to reach the last 16, losing 10-7 to Simon Whitlock. He played a full tour season, not doing enough to threaten any majors other than the Players Championship Finals, solidifying his place there with a quarter final and semi final in the last five events and then once there, he made the last 16, beating James Wilson and Dave Chisnall before losing a decider to Justin Pipe, missing one dart to take it. He only made one European event, which is a bit surprising, but did at least win through to the Saturday in Riesa before being handed a tough draw in Mensur Suljovic. Beaton's playing as well as he has done in years and is rightly considered the favourite, but O'Connor is a very dangerous opponent and not playing badly himself, and looking at the stats he is not too far behind. 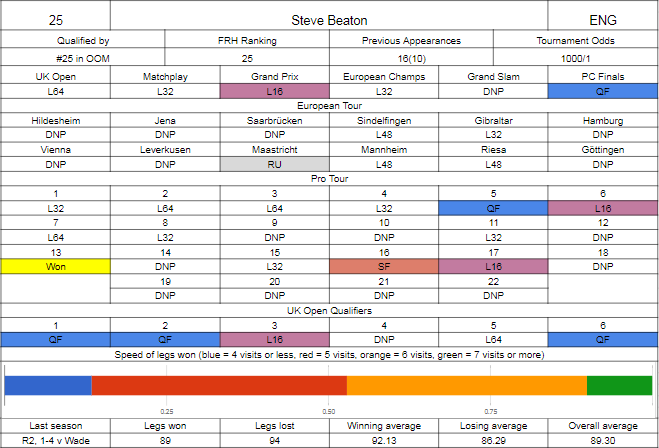 This genuinely could go either way, I'd tip things towards Beaton based on slightly better numbers, a wealth of stage experience and a relative lack for O'Connor (at least in a world championship setting).